ASSYST has been awarded the master services contract and long term agreement for providing IT services to a leading global development agency. The agency operates in over 170 countries around the world. This award is significant because it adds to ASSYST's history of supporting international and multilateral institutions. ASSYST was awarded to offer technology solutions and services in 3 task areas. The first area covers information technology projects around messaging and access control. The second areas will be to support the institutions's global telecom and communications infrastructure. The third area will be for Web application services which will cover support for Microsoft SharePoint and Adobe CQ platforms. ASSYST is a global information technology services company with its headquarters in the Washington Metro area. In the past 20 years of our operations we have delivered successful solution outcomes to customers. ASSYST has a diverse portfolio of customers in Government, Commercial and Multilateral institutions. Our solutions for Multilateral institutions focus on enabling practitioners to create & disseminate knowledge for development and public good. The areas of work include Content Management, Knowledge Management, Mobile Application Services, Open Data, Visualization and eLearning. This is apart from the services we offer to support corporate and administrative technology systems of our customers. ASSYST has been awarded the Master Services Agreement for Providing IT Services to a leading Development Financial Institution for Latin America and Carribean (LAC). This institution operates in 48 countries with $ 11.4 billion approved lending and grant budget. The Master contract is for a 3 year base period with an option for further 2 years. This is a significant award because it adds to ASSYST's history of supporting international and multilateral institutions. ASSYST was awarded to offer technology solutions and services in 4 task areas. The first area covers projects around commercial-off-the-shelf (COTS) packages such as PeopleSoft, Lawson, SAP, Misys, Pega and Crystal. The second task area requires ASSYST to offer services for general tools and programming support in the areas of .Net, SharePoint, BizTalk, HTML5, Java, MQ and Delphi. The third area is for Web Development and Graphic Design work. And finally the fourth area covers projects for Business Intelligence platforms such as Cognos with Oracle, Ascential Business Intelligence and BI using SharePoint. ASSYST is excited about this opportunity and continues to partner with international development institutions. 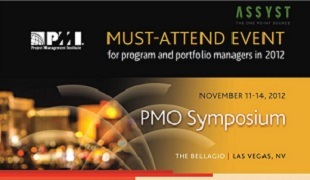 ASSYST is a proud sponsor of the 2012 PMO Symposium being held at The Bellagio, Las Vegas from Nov 11 - Nov 14. ASSYST’s PMO Services Team will be at booth number 22 in the symposium exhibit area. Please stop by to learn about how we are helping customers in healthcare, insurance, banking, financial services and the federal government maximize their IT investments. ASSYST services focus on providing support of multiple tools and platforms that reside in traditional PMOs via an integrated managed services delivery model. With scarce resources, increasing project complexities and the growing trend in IT outsourcing, conflicts can arise when vendors are tasked with managing the same systems that PMOs use to track their performance. Hence, organizations are realizing the need for a dedicated PMO services partner. ASSYST ensures that our client PMOs have adequate resource capacity coupled with significant cost monitoring and control capabilities. The components of ASSYST’s Managed Services for PMO include Project Portfolio Management (PPM), Governance, Requirements Management, Information Technology Service Management (ITSM), Process Management, Configuration Management, Change Control, and Quality Assurance. When customers embrace these services, PMOs emerge equipped with actionable knowledge and useful reporting capabilities. Executives have access to real-time data about project health, while ASSYST manages the tools/platforms and systems integration/automation needs of the PMO. ASSYST, headquartered in Sterling, Virginia, is a leading information technology (IT) solutions provider with a successful track record of providing business and technology consulting services to a host of clients ranging from federal, state and local governments to Fortune 500 companies. Founded in 1993, ASSYST has a team of experienced and energetic IT professionals and support staff that are driven by a passion for excellence and work diligently to achieve the company’s goal of being The One-Point Source (TOPS) to cater to the computing needs of its diverse clientele. ASSYST has an enterprise-wide approach to quality and is committed to continuous process improvement. Our CMMI Level 3 assessment reflects the high level of organizational maturity at which we operate, and ensures that the processes and practices we have put in place will result in high quality deliverables for our clients within time and budget constraints. ASSYST has always measured success in terms of the success of our clients and we adopt a partner approach to client engagements. With the pool of highly talented professionals, comprehensive project management and quality assurance procedures; the technology bandwidth and flexible engagement models ; the number of years in operation; the maturity of the senior management team; and the ability to deliver productivity and quality at substantially lower costs, ASSYST is your ideal partner for IT initiatives. ASSYST is awarded a contract from the Department of Health and Human Services, Centers for Medicare & Medicaid Services for Software Development Program Support (SDPS). This is a 5-year contract for providing software and training development services for CMS and this contract award represents significant expansion for ASSYST in the Health IT and IT security areas. This contract is in support of the Defense Language and National Security Education Office (DLNSEO) to provide software development, administer and consolidate the infrastructure, platfomrs and applications. These services include hosting and maintaining several web-based applications and databases, as well as hosting websites and email. Advanced Software Systems, Inc. (ASSYST) is honored to be part of the Integrated Project Team (IPT) responsible for the Montgomery County Siebel Public Sector Implementation that Won the Gartner Award for Customer Analytics. Montgomery County, Maryland’s program recently won the 2011 Silver CRM Excellence Award in Customer Analytics from Gartner & 1to1 Media. The MC311 program is a customer-centric service center for the County’s constituents. Prior to the implementation of Siebel CRM, the County was unable to track the volume or type of cases because they were handled by each department, separately. Today, the MC311 program is a centralized customer service center that is citizen-centric and handles cases for over 1 Million citizens and provides a self-service website to enter and track requests, as well as access to an extensive knowledge-base about other County related services. ASSYST has been implementing ERP, COTS and CRM Solutions for nearly two decades. Our capabilities include Product Selection, Implementation, Systems Integration, and Operation and Maintenance. ASSYST has expert level capability implementing COTS solutions using an Agile Development Framework. ASSYST has expert level capability implementing ERP, COTS and CRM systems using vendor products that include Oracle, SAP and Microsoft. The partner and company names and their logos are acknowledged, and are registered trademarks of their respective owners. ASSYST's implementation of CA's Clarity PPM platform successfully went live at a leading Mid-Atlantic based health care organization. The implementation will support the Strategy & Operations unit of the organization. ASSYST was involved in a three-phased CA Clarity PPM implementation for the client. Phase I involved setting up the Clarity PPM environment for the production, UAT, QA and development environments, configuration of CA Clarity PPM and implementation of the Project Management module. This phase involved loading of all resources to Clarity and creation of delivery roles aligning with customer's service delivery organizaton. Phase II of the project consisted of implementation of Demand Management, Resource Management and Portfolio Management modules. ASSYST provided integration with corporate systems, and created dashboards and reports utilizing Business Objects and Xcelsius. Phase III of the project focused on the implementation of Capital Management, Financial Managment and migration of Time Entry to Clarity PPM and Schedule Management. ASSYST is continuing to support this customer with enhancement, and operations and maintenance of the CA Clarity PPM platform involving Financial Planning and Management, and Reporting.
" ASSYST provided thought leadership and strategy throughout the implementation using a close-knit team of subject matter experts, as well as functional and technical analysts, partnering with the client every step of the way and utilzing lessons learned from similar other health care PPM implementations to ensure successful completion", remarked Vinay Shirke, PPM Practice Director at ASSYST. ASSYST is a CA Clarity Partner. We have an established CA Clarity PPM practice led by a team of CA Clarity trained and certified professionals helping organizations put in place a robust IT governance that brings greater visibility, transparency, accountability and measurement into IT initiatives, thereby improving project management and reducing total cost of ownership.Our end-to-end Clarity service includes, in-depth Clarity Functional Consulting, accelerated CA Clarity PPM accelerated Upgrade Services, Operation & Maintenance of existing Clarity implementations, and Clarity Enterprise Integration and Reports, Dashboards & Interface Development. ASSYST’s CA Clarity offerings provides a measurable benefit to our clients resulting in increased productivity, faster completion of IT initiatives, reduced risk of failure and lower workload for in-house teams. Our onsite-offsite service delivery model brings in great benefits to clients by offering them the best of both worlds – cost reduction and value addition. ASSYST was involved in a three-phased CA Clarity PPM implementation for the client. Phase I involved setting up the Clarity PPM environment for the production, UAT, QA and development environments, configuration of CA Clarity PPM and implementation of the Project Management module. This phase involved loading of all resources to Clarity and creation of delivery roles aligning with customer's service delivery organization. Phase II of the project consisted of implementation of Demand Management, Resource Management and Portfolio Management modules. ASSYST provided integration with corporate systems, and created dashboards and reports utilizing Business Objects and Xcelsius. Phase III of the project focused on the implementation of Capital Management, Financial Management and migration of Time Entry to Clarity PPM and Schedule Management. ASSYST is continuing to support this customer with enhancement, and operations and maintenance of the CA Clarity PPM platform involving Financial Planning and Management, and Reporting.
" ASSYST provided thought leadership and strategy throughout the implementation using a close-knit team of subject matter experts, as well as functional and technical analysts, partnering with the client every step of the way and utilizing lessons learned from similar other health care PPM implementations to ensure successful completion", remarked Vinay Shirke, PPM Practice Director at ASSYST. The US Federal Legislative body has awarded a multi-year contract to ASSYST for providing design, development, and on-going support services using Drupal, the open-source web content management system. The Legislative body, which has standardized on Drupal as their web content management and publishing platform, is the latest large government organization to transition their online presence to Drupal. ASSYST will be responsible for developing new websites and revamping existing websites of individual Members of the House during the duration of the contract. ASSYST has extensive experience in implementing Drupal content management systems (CMS) for government, non-profit and commercial organizations across the globe. Advanced Software Systems Inc. (ASSYST) is a global CMMI level 3 information technology solutions provider with a track record of successfully delivering end-to-end IT services to Federal, State and Local Governments and Fortune 500 companies. Our experienced functional and technical IT professionals are driven by a passion for technology, and share our Vision of being The One-Point Source (TOPS) in catering to the computing needs of our diverse clientele.